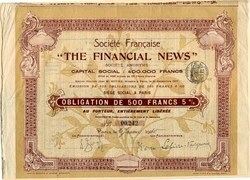 Beautiful certificate from the Societe Franaise Financial News issued in 1910. This historic document was printed by Fono De Garantie and has an ornate border around it. This item has the signatures of the Company's President and Secretary and is over 97 years old. 14 coupons attached on bottom not shown in scan.